My oldest has been studying in Europe this semester. Using CTMH's So Much Happy line, I created some fun, travel LOs. So far, my daughter has been to Italy, France and Germany. Next week, she is going to Spain. Oh what a life! The first LO was taken from the Workshop Your Way (WYW). Because I love all of the paper's colors, I had to have these little strips! I changed the LO up a bit and added Journey as a title from the CTMH 'You Are Here' Cricut collection. For the second LO, I cut out a square shape using CTMH's Art Philosophy cartridge. This cartridge is an oldie but goodie! And I love the Rainbow &. Title and sun cut using CTMH's 'You Are Here' cartridge. 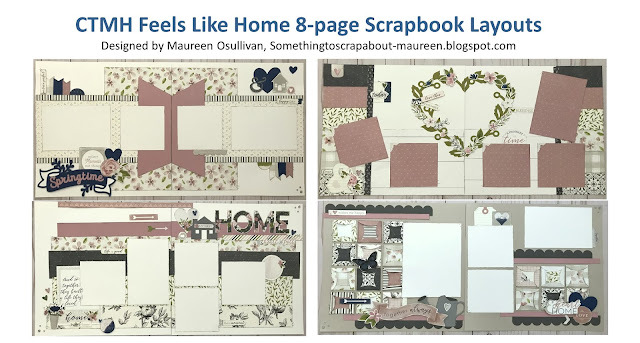 I will be teaching this scrapbook class in April. Pre-cut kits will begin shipping next weeks. Cutting Guides and e-files are also available. Thank you so much for stopping by! Go Spring! I'm here today to share 6 pages I created using CTMH's "I Heart Us" paper line. The paper line is very colorful with its rainbow pattern. The line works with both boy and girl pictures. Here's a look at all six pages. Taking a closer look, you'll see that added some black photo mats and scalloped edges to make this funky design. For the second LO, I had some family pictures in mind. So, I cut out a "Our Family" banner. For the last LO, I used a variety of chipboard and sticker hearts. I'll be making some pre-cut kits and offering a consultant cutting guide. If you'd like to purchase one, please click on the Kit tab. Today I'm heart to show you about some cards I recently created. Some of the cards use stamps that recently retired. However, I have a few extra stamp sets as I'll be teaching this class in January at our fourth annual Winter Wonderland Overnight Crop. For this class, I got a little help from my CTMH friends-- Becca Whitham and Liz Johnson. Both are fabulous designers and once I saw a couple of their cards my mind was made up! This is one of my favorite cards. Liz Johnson of Liz Ann Designs created this and I just changed up the colors to match the Feels Like Home paper line. Colors: Sugarplum, Fern, New England Ivy, Sapphire, and Heather. Here is a card using CTMH's Thin Cut Borders. I used the Border set to make a notebook border and a pull tab. I then used CTMH's retired pull tab stamp set to stamp 'Open Me' and 'Happy Birthday'. The next card uses CTMH's Shaker and Confetti Die set. You can purchase silver and gold sequins to put inside the shaker. There is also a die to make your own confetti. To match the paper line, I made some Sugarplum confetti. I used CTMH's Stitched Hearts die set to make the small heart. To make this card, I used CTMH's Decorative Border set again. This set is awesome! The last card is another one of my favs. Becca Whitham created this desgin and I love it! Also, this is one of my favorite stamp sets and I have 3 in my inventory:) If you missed ordering this stamp set and need it, please let me know. I'll be teaching all 5 cards at the January Winter Wonderland Overnight Crop at the Sea Crest Hotel in Falmouth MA. If you can't make this event, then order your pre-stamped kit now. CTMH just came out with a new line called Happy Heart and it is super cute. So far, I created one layout and wanted to show you. This LO is very special to me. The LO documents a 16th birthday party that my youngest daughter attended. Sadly, one of her friends, Chris, passed away 1 month after this party. Chris had epilepsy and died from a seizure. My daughter designed a sweatshirt in Chris' honor to raise money for his family. I never met Chris, but he will be ever in my heart as someone my daughter truly loved as a friend. If you'd like to order Happy Heart, then please do so now. The line is available through February 28 or while supplies last. I'm back again with another kit from CTMH. This kit was created by me using the 'Oh What Fun' paper line. And, I had so much fun with this line! The colors are so bright. Here, I created a winter LO-- perfect for skiing, sleding, skating or just hanging out in the winter. The colors are fine for either a boy or a girl. For the last LO, I went back to my winter theme. I stamped and die-cut an assortment of snowflakes. The 'Oh What Fun' Scrapbook pre-cut kit and/or instructions and Cricut files will be ready to ship next week. Be sure to get your kit in time for winter time memories. I'm home today recovering from a migraine:( I've been busy creating all sorts of pages. Today, I'll show you 4 scrapbook LO's using CTMH's Hello Pumpkin Scrapbook kit. Here CTMH mixed two lines together-- Hello Pumpkin and Boutique. Hello Pumpkin is Halloween/Orange style, but when paired with Boutique, it's something quite different! The first one is my favorite-- I just love how the page is folded down. Of course, I had to add my own twist to the kit by stapling down the folds, adding a title, extra pictures, a tag and a bow. I find that when I add my own pictures to a kit, I kind of just go with it. CTMH also designed 2 more single pages. Here's a look below. Well, this kit is only available through 12/31/18 or as supplies last. Be sure to get yours before they sell out. Hi, I'm back again sharing some holiday spirit! This time I have some cards to share using CTMH's Christmas Blessing set. This set is only good through December 31st or while supplies last. The kit comes with enough supplies to make 12+ cards. And, you can change up the colors or make your own design. Below are the cards using CTMH's new colors SugarPlum and Sage. Again, this classic retro set is only available through the end of December or while supplies last. Be sure to get yours today. Hi and happy Thanksgiving weekend! With Thanksgiving comes Christmas. 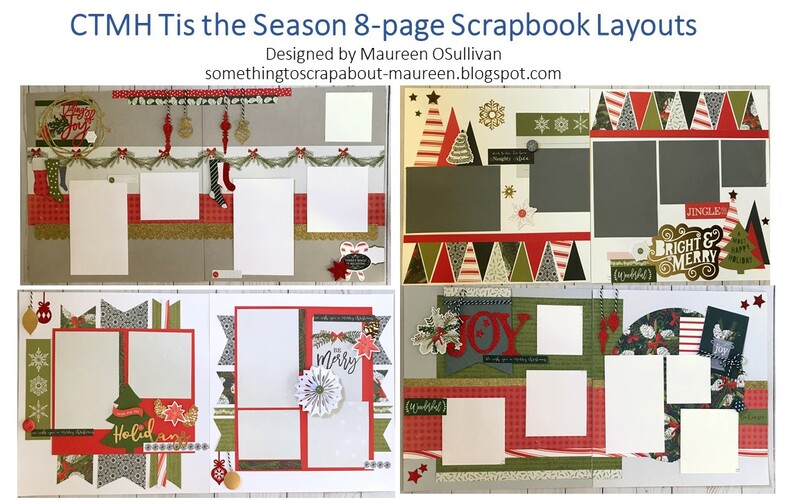 And, I've been busy creating some LOs to help you document this wonderful holiday using CTMH's 'Tis the Season' paper line. I had so much fun working with all the rich reds, greens and grays. To make it pop more, I added some Gold glitter paper for trim and ornaments. I'm not sure what LO I like the best-- I like them all! I'll be teaching this class at our fourth annual Winter Wonderland, which will take place on January 17-20 in Falmouth Ma. Kits will also be available. Kits will ship the first week of December. Cutting guides available too. Thanks for stopping by. And hopefully this gets you into the Holiday spirit! I'm back again today with another project using CTMH's Fall line-- Grateful Heart. To create the little scribbled circles, I used CTMH's new stamp:'Tis the Season' Scrapbook stamp set.